Do you have missing teeth? Do they make it difficult for you to speak clearly or impossible to eat all of your favorite foods? Do they make you shy away from meeting people or cause you to avoid social functions altogether? If so, each of these problems and more can be completely taken care of with dental implants in Central Texas. They are the most permanent and aesthetically pleasing tooth replacement option currently available today, and you can get them right here in Central Texas with Dr. Rick Cofer’s help at Premier Family Dental. 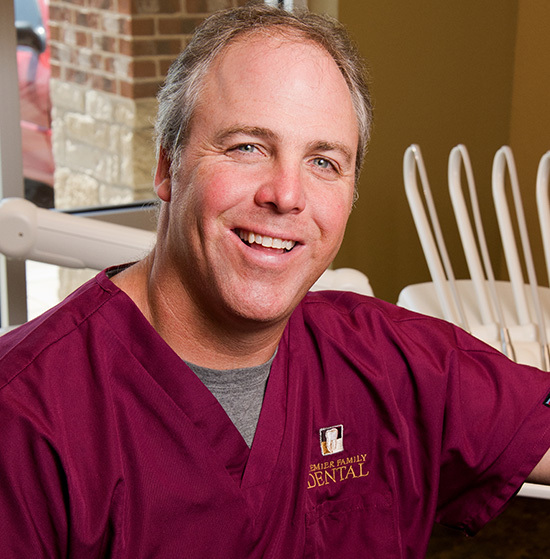 Dr. Cofer is an Irving, TX native who received his dental degree from the Baylor School of Dentistry. Since graduating, he has logged nearly 200 hours of continuing education dedicated solely to implant dentistry, and he has rebuilt hundreds of smiles with dental implants as well. He is proud to have one of the few practices in the area that can provide the complete procedure in-house, meaning he can save his patients time and help them achieve comprehensive, fantastic results. Dental implants are relatively simple in structure, consisting of three basic parts: a titanium root, an abutment, and a dental restoration. This titanium root is what makes implants so special – they replace the entire tooth structure unlike crowns and bridges (which only replace the visible part of the tooth). 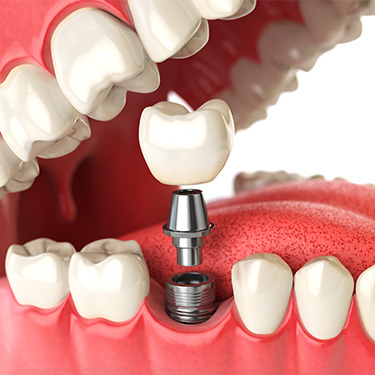 The abutment is a small, screw-like device that attaches the restoration to the titanium root. Dental implants are so versatile that they can be used to replace a single tooth, multiple teeth, or even an entire mouthful of teeth. The reason dental implants are Dr. Cofer’s favorite way to restore missing teeth is that they are the only procedure that recreates the entire structure of the tooth – both the root and the crown. Having a new root in place accomplishes a myriad of things other treatments simply can’t. The new titanium root establishes an extremely sturdy base for the replacement teeth, meaning that once they are in, you can trust them to stay there for a lifetime. They also provide essential support to the jawbone. The roots of your teeth support your jaw from the inside, and this is what gives it the strength to hold your other teeth in place. Once it has been lost, the jaw typically starts to recede and weaken. This can still happen with crowns and bridges, but dental implants can prevent and even reverse this process. The end result is that your missing teeth will be completely replaced in a way that not only makes your smile look better but also feels better and healthier as well. How Can I Get A Dental Implant? This is a minor surgical procedure where Dr. Cofer will make a small incision in your gums and position the implant post(s) so that it can provide maximum hold and stability. He’ll use a variety of scans and X-rays to make sure it is in the perfect place. You’ll then be given 4-6 months for your gums and jaw to heal. Any pain or soreness from the procedure usually lasts about a week, and it should be easily managed with over-the-counter medication. This period is mostly to allow time for the posts to naturally bond to your jawbone through a process called osseointegration. This is another reason why dental implants are so reliable and durable –the posts connect to your jaw just like your natural teeth. During this time, you’ll have a temporary restoration so you can always smile with confidence during the process. 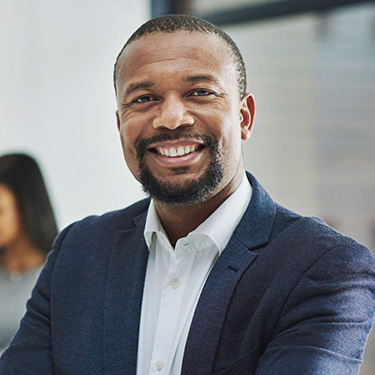 You’ll return to Premier Family Dental when you’re fully healed so that Dr. Cofer can place your abutments, which is what will connect your restoration directly to the implants. After you have healed, your final restoration will be placed, and your new smile will be ready for the world! An all-porcelain crown will be used to replace a single tooth. Dental porcelain is just as strong and durable as natural enamel, and it can be specially shaded to seamlessly match the rest of your smile. Dental implants can also be used to support a bridge. Once an all-porcelain crown has been placed, it can be bonded to multiple prosthetic teeth that will simply sit on top of the gums. This is much faster than replacing each individual tooth with implants, and it doesn’t require your other teeth to be filed down to hold crowns (which is required for traditional bridges). Multiple implant posts can support a partial denture. Traditional partial dentures can be very uncomfortable and place pressure on the remaining teeth, but that isn’t the case with an implant-retained denture. This prosthetic is supported by the titanium posts, which not only leave the remaining teeth alone (making them much more comfortable) but also provide the benefit of having your root structure restored. Since they are held in place with dental implants, they will never slip, pop, or click. They retain their fit for much longer because they support the jaw and keep it healthy and full. They provide a much stronger bite force than traditional dentures, which means patients can enjoy a wider variety of healthy foods. Many patients can’t chew essential proteins and vegetables with normal dentures, and they often become malnourished. This is why people with traditional full dentures tend to live 10 years LESS than the average life expectancy. Thankfully, implant-retained dentures can correct all of these problems and last an entire, healthy lifetime. Dental implants work by using a titanium root, an abutment, and a dental restoration to replace the entire structure of a missing tooth. This is unlike any other restorative procedure that just replaces the crown (the visible part of the tooth). Why are they better than traditional crowns or bridges? Without the teeth roots to support them, the jaw and gums tend to weaken and recede. While a traditional crown and bridge might look great, they do very little to stop this process, and they often can’t prevent additional tooth loss as well! Dental implants have all of the aesthetic benefits of traditional restorations with the added advantage of being a clinical solution because they restore this essential support. 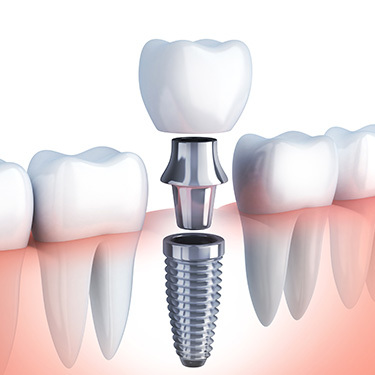 When it comes to health, looks, and durability, dental implants are by far the best way to replace missing teeth. This can vary greatly from person to person. Many people can complete the entire process in less than 6 months, while more complicated cases can often take over a year. Dr. Cofer will be able to map out your particular treatment plan at your first appointment so you can get a better idea of your particular timeline. How many teeth can dental implants replace? Dental implants are very versatile and can replace a single tooth, multiple teeth, or an entire mouthful of teeth. Dental implants can easily last for 30 years or more with the proper maintenance. They just need to be taken care of like your natural teeth. With daily brushing, flossing, and regular checkups at Premier Family Dental, your dental implants should look like new for many years to come. How does the cost of dental implants compare to other restorative procedures? Dental implants might seem to be more expensive than other restorative procedures, but they are actually extremely cost-effective over the long term. Traditional crowns, bridges, and dentures typically have to be replaced every 5-10 years, while dental implants can easily last over 30. This means that for many, dental implants are a one-time cost with decades of consistent benefits. Also, many insurance plans provide excellent coverage for dental implants, and we also accept payment plans through CareCredit and Compassionate Finance if you need low-to-no interest financing. All in all, when it comes to cost versus outcome, dental implants are one of the best deals in not just dentistry, but all of healthcare. 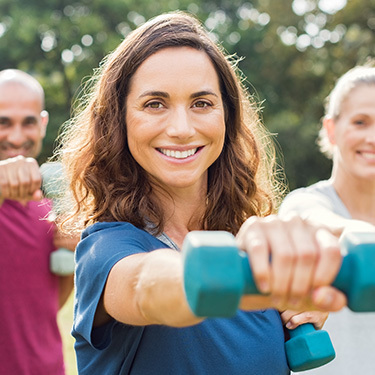 If you’re tired of hiding your missing teeth and not eating your favorite foods, dental implants can give you the solution you’ve been looking for. In just a matter of months, you can have a healthy, beautiful, and functional smile you’ll be eager to show off again. To get started, all you need to do is contact our office today for your first consultation.